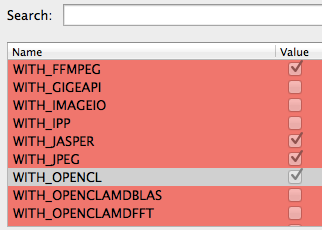 oclMat module(=OpenCL implementation) is added from OpenCV 2.4.3. This page describes the method to use this module. If you want to know the detailed information, please read Official document. The following description is assumed that the development environment of OpenCL has been installed previously. You need to build OpenCV using CMake. Please enable WITH_OPENCL, push Configure button and push Generate button. Please add the following library to your project. call cv::ocl::getDevice() for the initialization of OpenCL device. converts to cv::ocl::oclMat from cv::Mat by of the constructor of oclMat. call image processing function of oclMat. converts to cv::Mat from cv::ocl::oclMat by download(). Transfer between CPU and GPU(upload() and download()) is very slow. So, you need to minimize the number of calls. The first execution of oclMat's image processing is slow. Because, compile of OpenCL kernel is processed too. You may avoid by the call of function as dummy at startup. If you have question, please send e-mail to the following address. PukiWiki 1.5.1 © 2001-2016 PukiWiki Development Team. Powered by PHP 7.1.26. HTML convert time: 0.298 sec.